A contemporary retelling of H.G. Wells's classic, the sci-fi thriller reveals the extraordinary battle for the future of humankind through the eyes of one American family. Fleeing from an extraterrestrial army of killer Tripods that annihilate everything in their path. Ray Ferrier races to keep his family safe. After dabbling in the drama/comedy genres ("Catch me if you can" and "The Terminal"), Steven Spielberg is back at what he does best, creating what is commonly known as a summer blockbuster. 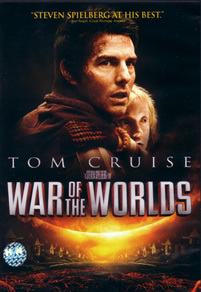 Released in June 2005, “War of the Worlds” is a loose adaptation of H.G. Wells’s renowned science-fiction classic. Seen through the eyes of Ray Ferrier (Cruise), a “less-than-perfect” divorcee who has problems in being a responsible father to his kids. So by confining this small family in a huge disastrous scenario, Spielberg and screenwriter David Koepp (both has worked on Jurassic Park and it’s sequel previously) successfully blend action, science fiction and family values into one. As if to contrary his matinee good look, Cruise has the tendency to play characters with flaws, liked the cold-blooded killer in “Collateral” or the guilt-ridden cop in “Minority Report”. Despite frequent negative news about him in the media, Cruise’s immersion and passion about acting is undeniable. In “War of the Worlds”, his character is not the typical American Hero, he begins to bond and protect his kids only through the grueling process of escaping from the Aliens. And Dakota Fanning who plays his daughter, Rachael is no doubt one of the most talented young actress in Hollywood today. There’s no better director than Spielberg who is so adept at developing a buildup so strong that once Morgan Freeman’s prologue fades out, the ominous atmospheric will consume you. By combining state of the arts visual effects from ILM and carefully trigged physical effects, the menacing tripods are as realism as they can get. Not to give anything away, the harrowing score by John Williams companying the whole sequence with Ray running away from the killing machines to the family’s escape on the mini-wagon will glue you to the seats. It’s fortunate that Spielberg and Koepp’s stand from the start is to avoid blowing up familiar global landmarks as shown in “Independence Day” and “Armageddon”, an overused pyrotechnics show-off by Hollywood. The angle is strongly focused on Ray and his kids. However, things start to go to a halt with the introduction of Tim Robbins’ character, a paranoid man who sheltered Ray and his daughter in his barn during one of the attacks. The struggle for survivability ensured even in the company of our own fellow men and perhaps this is what Spielberg is trying to bring across. Taking a cue from the 1953 “The War of the Worlds” and update it with modern touches, “War of the Worlds” succeeds in bringing the beloved classic literary to a new level. It’s an amazing thrilling and must-have experience for your home entertainment. Perhaps this is one of the reasons why this is a barebone disc, it comes with both Dolby Digital 5.1. and DTS 5.1 soundtrack. Toggle between the two and experience the different bass levels or if you don't possess a fancy system, just stick to the usual DD 5.1. The sound mix is particularly strong for this title, it's time for the surround and rear speakers for a thorough workout. Dialogues are of high clarity as well. Visually, there is a balance level of blue and dark hues. Grainy at times but this is perhaps due to Spielberg's longtime cinematographer favourite style of discoloring the film stock. Nevertheless, it's still a recommendable transfer in terms of audio and visual.